The revised and expanded 3rd Edition of this widely popular text provides proven how-to guidance for the management of 52 of the most common musculoskeletal disorders seen in today's clinical settings, including strains, sprains, overuse injuries, and inflammatory and arthritic conditions. It explains each problem, how a typical patient describes the discomfort, what to look for during the examination, when to request X-rays, and how to draw a sound diagnosis from clinical observations. The text features updated tables of supports, braces, and casts that make it easy to choose the most efficient and cost-effective immobilizers. Features the expertise of Dr. Bruce Carl Anderson, a world authority on orthopedic practice in primary care. Presents straightforward, proven "how-tos" for the 52 most common orthopedic problems—20 new to this edition. Offers detailed descriptions and simple but effective anatomical drawings that demonstrate the 37 most effective local injection sites. Features 30 ready-to-copy patient information sheets that show patients how to do rehabilitation exercises. Includes many at-a-glance tables that compare dosages outline costs detail the uses of injectable corticosteroids, NSAIDs, and calcium supplements * and show supports, braces, and casts. 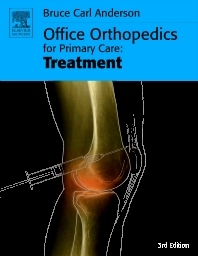 “This practical reference book for office orthopaedic conditions will assist the primary care clinician, especially with treatment, rehabilitation, and soft tissue or joint injection.”—Family Medicine, review of the previous edition.